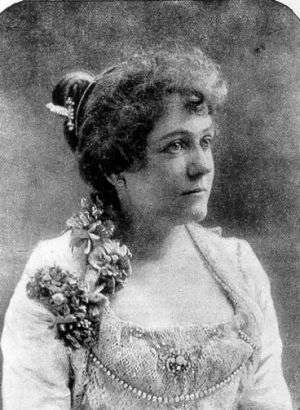 Frances Amy Lillian Sherwin (1855–1935), soprano, was born near Huonville. She sang at local concerts from an early age. In 1878, members of the Pompei and Cagli Italian Opera Company were picnicking near Amy's home when they heard her singing in a field. They persuaded her to join them, and she made a triumphant debut at Hobart's Theatre Royal as Norina in Don Pasquale. She toured in Melbourne, Ballarat and Sydney and almost overnight was dubbed the 'Tasmanian Nightingale' by admirers. The first Australian singer to make an overseas impact, Sherwin travelled extensively, performing in America, Europe, Asia, South Africa and Australia. In 1897 enthusiastic Hobart fans unharnessed the horses from her carriage and pulled her triumphantly through the streets. Sherwin retired to England, but spent her later years in poverty and sickness. Further reading: ADB 6; J Bowler, Amy Sherwin, Hobart, 1982.